Yves here. This article argues that people don’t mind inequality due to “brute luck”…but is one man’s brute luck another man’s rigged system? Tax policy to correct inequality assumes that nobody is entitled to advantages due to luck alone. But the public largely rejects complete equalisation of ‘brute luck’ inequality. This column argues that there is near universal public support for an alternative, benefit-based theory of taxation. Treating optimal tax policy as an empirical matter may help us to close the gap between theory and reality. Charité et al. (2015) interpreted their survey results as implying that: “[I]ndividuals, placed in the position of a social planner, do in fact respect the reference points of others.” Lockwood and Weinzierl (2016) used the standard model to quantify the implicit priority that policy has given to pre-tax resources. Scheve and Stasavage (2016), political scientists, presented extensive evidence that the equal sacrifice principle has played a prominent role in tax policy across a range of developed countries over the last century. The view that individuals have no moral claim to their pre-tax incomes relies on the ethical assumption that nobody is entitled to advantages due to factors outside his or her control. Philosophers such as Cohen (2011) call this ‘brute luck’. Given the importance of brute luck (for example, natural ability, childhood home environment, and early schooling) to a person’s economic status, this assumption directly leads to a rejection of moral claims to pre-tax income. The 2016 US presidential campaign’s attention to inequality fits these findings. Some candidates complain of a ‘rigged system’ and rich individuals and corporations who do not pay their ‘fair’ share. Critically, gains due to a rigged system or tax avoidance are due to unjust actions, not brute luck. They are due to the toss of a loaded coin, not a fair one. These are early steps in developing a new approach to tax theory that I have called ‘positive optimal taxation’. This approach modifies the standard optimal tax analysis by treating the objective for taxation as an empirical matter. It uses a variety of sources – including opinion surveys, political rhetoric, and analysis of robust policy features – to highlight gaps between the standard theory and prevailing reality of tax policy. It also identifies and incorporates into the theory alternative goals – and the philosophical principles behind them – that better describe the public’s views on policy. The hope is that this complementary approach will help us to close the gaps between the theory and reality of tax policy, and so generate popular and powerful policy responses to economic inequality. This entry was posted in Free markets and their discontents, Guest Post, Income disparity, Politics, Social values, Taxes, The dismal science on September 24, 2016 by Yves Smith. “I stole it fair and square” is not a form of brute luck, but I saw no recognition of that fact while skimming the article. Sorry if I missed it. One piece of logic missing from the research analysis is accounting for the game itself. If I agree to play a game of chance that is fairly played I am by default also agreeing that I accept the possibility that the outcomes will not be equal, otherwise why would I play. It shouldn’t be a surprise that in the end people are willing to maintain that inequality because they originally agreed to it by the fact that they agreed to play. As Yves points out, if you change the scenario where one of the players was allowed to collude with the person executing the game and the other player was informed of this you might get a very different answer. You might even get a punishing answer. The trick or con being played by the elite is to convince enough of us that the game of life is being played fair. And when that fails, the con or lie becomes that its the fault of (insert target minority group). From two complementary sociological points of view -conflict theory and symbolic interactionism- this article is naive -or a red herring- in the ways you suggest. Indeed, the issue is about people accepting a “definition of the situation” that is in fact detrimental to their material interests (Pierre Bourdieu terms this “misrecognition”). Erving Goffman, who was trained as an interactionist, studied con artists to describe how they successfully created a definition of situation -which means a a version of social reality- that their marks would internalize as reality itself. A sociologist would not begin a discussion of socioeconomic inequality with tax policy. A sociologist would not begin a discussion of socioeconomic inequality with tax policy. But an economist would, and therein lies the problem. Control over arguments regarding political economy in the public sphere have to be wrested from economists, so that we can start to talk about what actually matters. Sanders’ popularity, despite his numerous problems, lay in how he took control of the argument and laid bare the absurdities of those who benefit from the status quo. I say we boycott economists. Sure some of them are not terrible, but in the main the discipline needs to be torn down and rebuilt from the ground up. Many economists function as members of the courtier class, justifying what the rich and powerful want to occur. Most citizens already boycott economists in that they don’t use their services except when required to attend an Econ class at school. But economists do influence average citizens lives via their justification of tax policy, land use policy, labor policy, trade policy and law implementation. Even if we tore down the profession, it could likely regrow to provide the same functionality. The profession provides a valuable service, as it is valued by the class with power and money throughout the world. Economic education has been a failure of the left. Everyone needs to know how money and finance works. Only then can that power be put to various uses. It is not that you don’t need economists, you need economists working in your interest. All knowledge and technology works this way. It is the purposeful use of information that matters, not the information itself. The left wastes time, effort, and resources trying to convince people to change their minds. Instead, they need to focus on building things in the real world, using all the economic tools at their disposal. I could get behind this. And I would have to agree that harping against the evils of capitalism, which are very real, often comes from those who don’t really understand how it works. Maybe the solution is more co-ops and less rhetoric. Using the power of the boycott is another. The powerless need to rediscover what power they truly wield in this system. That was the other failure of the left. Yes, they were actively crushed by corporate power, but the ideas live on. They can only be exterminated through lack of use. A new ideology needs to be born of the ashes. If the predictions of climate disruption are anywhere near accurate, a proactive, and positive direction can be undertaken. My experience is that caring, healthy people are driven to help others in times of adversity. Well, those times are coming. We are once again going to have to face the choice between choosing abject fear or rolling up our sleeves and getting back to work making everyones lives better. You don’t need corporate sponsorship to do that. They need us more than we need them. In the end, I have a feeling that the current system will come down very quickly. Being prepared for that outcome is what should be driving the actions of those not vested in keeping the status quo going. This hits the nail on the head. In fact it inadvertently points to what happened after the Powell memo. A mass invasion of corporate money invaded business and economic departments in colleges with a view to ‘educating’ the public about the ‘virtues’ of the free market and Austrian economics. We need to do the reverse now, i.e. go back to the time when Keynes ruled the roost in most economic departments and Drucker was taught in business schools. The post indicates this guy is Assistant Professor of Business Administration — at Harvard Business School — so I’m not sure I would give him even so much regard as I might give an economist. I wonder how he and his will regard the fairness of luck while they wait in line to be serviced at the guillotine they’re building — much as Scrooge crafted his chain and weights for his afterlife. For a historian, making connections between past and present situations is the root of their insight. As in all walks of life, your efforts can gain value to your fellow citizens or they can be used as a tool for your own self interest- whatever that might be. How interesting are these repeating cycles in the human drama. Interesting reference to Scrooge- the power of art to enlighten the human condition cannot be underestimated. As I get older, it seems to me that the capitalism system debases everything it touches. Anything of real value will be found outside this system. It has become the box that confines us all. When your viewpoint of the world and your relationship to it shrink to only seeking profits, the depravity of that situation is hidden from view unless shocked back to awareness. I was particularly struck by your comment about art: “the power of art to enlighten the human condition cannot be underestimated.” I recall a similar assertion made in one of Howard Zinn’s speeches — sorry I can’t recall the exact phrasing of his statement or its context. I’m retired and found a strange calling to make art — a calling I never listened to when I had to worry about supporting a household. I find it difficult to make art that isn’t political, satirical or in some way didactic. Whether anyone else would regard my works as art I don’t know and in a way I don’t care. Art has become a way in which I must express something inside me I don’t understand but whose direction I must follow. I suppose similar feeling drive many expressions of art. Perhaps that explains something of the power of art you refer to. For the erosion in income inequality to be fixed, economic policies need fixed. The disparity between income quintiles will continue to widen. Social unrest will continue to proliferate. This situation will simply never get corrected until the commercial banks are driven out of the savings business (however bizarre one might think that solution is). Vladimir Lenin, leader of the 1917 Russian Revolution said: “The best way to destroy the capitalist system is to debauch the currency.” Not so. The best way to destroy capitalists is the deregulation of deposit caps for saver-holders’ accounts in the commercial banking system. This policy error simply increased the bank’s costs with no increase in their income. Bottling up savings, is first observed by the decline in money velocity, then by a decline in AD (secular stagnation), and when the Fed attempts to offset this decline, by an increase in stagflation. The beliefs come first, then the system reflects these. Creeping individualism and the belief in the self made man will do the trick. How can the “code” be modified to restrain usurious AND sociopathic behaviour? Vi is contrived. Vt is money actually exchanging counterparties. But since Ed Fry discontinued the G.6 debit and demand deposit turnover release in Sept. 1996, the Fed has no rudder or anchor. Required reserves are a surrogate, though the underweight Vt. But RRs are based on payments (money turning over). And 95 percent of all demand drafts clear thru transaction based accounts. The “code” you speak of relates to the volume of financial transactions consummated. Financial transactions are not random. Financial speculation is a function of money flows. The volume of bank debits during the housing crisis would have stood out like a sore thumb (as it captured both new and existing real-estate transactions). Only price increases generated by demand, irrespective of changes in supply, provide evidence of inflation. There must be an increase in aggregate demand which can come about only as a consequence of an increase in the volume and/or transactions velocity of money. The volume of domestic money flows must expand sufficiently to push prices up, irrespective of the volume of financial transactions, the exchange value of the U.S. dollar, and the flow of goods and services into the market economy. The “administered” prices would not be the “asked” prices, were they not “validated” by (M*Vt), i.e., “validated” by the world’s Central Banks. You can’t apply double-entry bookkeeping on a national scale any longer. The Fed has finally achieved their objective, that there is no difference between money and liquid assets. The DIDMCA of March 31st 1980 laid the legal framework for the addition of 38,000 commercial banks and the abolition of 38,000 non-banks to the 14,000 CBs we already had. That’s what caused the S&L crisis. But in doing so, the Fed never change the money stock’s definitions. Now IBDDs are understated and M1 overstated. CB credit should not just include the commercial banks, it should include the DFIs, money creating deposit taking financial institutions (the MSBs, S&Ls, and CUs loans and investments), as they have all become DFIs with the widespread introduction of ATS and NOW accounts. The fact is that the source of time/savings accounts within the commercial banking system is simply other bank deposits (e.g., demand deposits), directly or indirectly via the currency route (never more than a short run situation), or thru the bank’s undivided profits accounts. I.e., all CB time/savings accounts, rather than being a source of loan-funds for the commercial bankers, are the indirect consequence of prior bank credit creation. And the growth of bank deposits can be largely accounted for by the expansion of bank credit. In almost every instance in which John Maynard Keynes wrote the term bank in “The General Theory of Employment, Interest and Money” published in Feb. 1936 (his magnum opus), it is necessary to substitute the term non-bank in order to make Keynes’ statement correct. This is the source of the pervasive error that characterizes the Keynesian economics, the Gurley-Shaw thesis, the elimination of Reg. Q interest rate ceilings, the DIDMCA of March 31st, 1980, the Garn–St Germain Depository Institutions Act of 1982, the Financial Services Regulatory Relief Act of 2006, the Emergency Economic Stabilization Act of 2008, sec. 128. “acceleration of the effective date for payment of interest on reserves”, etc. The next generation will understand the luck factor as not everyone can be standing in the same spot at the same time, but it will not accept the scrooge. Oh my! Childhood home environment and (gasp!) early schooling are matters of luck? Oh those Haaahvaahd guys! No, professor, winning the lottery is a matter of luck, and can happen to anyone at any point in their life. Being born in poverty, into a class 15% of whose male population is incarcerated or having to go to a crappy school are *systemic* results of deliberate social structures, the elites just prefer to call it “bad luck”. Thus we see how the Ivies serve the elites. Yes, HotFlash. And these ‘deliberate social structures,’ the ‘red-lining’ policies, the wildly unequal sentences for crack versus cocaine, the casual brutality of the prison system (over 200,000 male rapes per year), the laws preventing people who have served their sentence for a felony from voting, public housing, scholarship aid, welfare .. in other words, from living and improving their lives .. are structural violence. And then we are ‘surprised’ when people who have lived their lives under a regime of these subtle but unrelenting acts of economic, social and spiritual violence, finally hit back. It’s also worth noting how his examples are still a function of the neoliberal canard that privilege is simply a boost on the ladder of meritocracy. The game is still implicitly understood to be fair. Yet, it’s not clear to me what Alice Walton, for instance, has done to justify being a multi-billionaire. People who are born not just with spoons but entire silver foundries in their mouths could redistribute 90% of the wealth they acquired by virtue of being someone’s baby and still be absurdly rich. so 2 zygotes decide to play a game, eh. The paper seems totally oblivious to the fact that in the scenario presented, all the gains enjoyed by both players are due to luck. Player B is getting a windfall either way, so there’s no sense of real unfairness. The perception would be quite different if it was only the difference between A and B that was assigned randomly, while each had to earn some baseline. And I think the “popular acceptance” part is given a huge boost when the young, black, nominally-Democrat president keeps insisting everything is awesome and anyone who says otherwise is “peddling fiction”. I think this paper goes to great lengths to build a question around the ideas of the fairness behind progressive taxation. This post hardly seems to pose a question worthy of study. Our tax systems so much favor Corporations and the wealthy that considerations of “fairness” are at best comical — and I’m not laughing. Yes, the outcome of self awareness will always be Anarchism. I came be an advocate, not through economics or politics, but thought Buddhism and Daoism. It is a story older than humanity that we are just starting to remember. So here I am sitting, watching, waiting for the rest of the world to catch up. What kind of self-knowledge did Hitler find in his imprisonment? It didn’t lead to anything I would call peaceable. Was there some inner Hitler he didn’t reach in his prison contemplations? Did Adolph know who he was? If I had only known it was luck, I would not have spent so many late nights in the library during undergrad and grad schools. However, I enjoyed those nights and was enriched by them. Is that taxable? Learning must be for its own sake. Like you, I spent many hours in the library. BUT it was to scratch an itch I have not been able to quell — even in these many years since I was in that library. It’s the luxury of finding yourself in a position to scratch itches that is so unfair. Most of us never get the opportunity. Heck, the library or university buildings with electric lights, indoor toilets, water fountains, air exchange systems, glass windows which open, access to roads or sidewalks to get there, belief that one can get there and back in relative safety without stepping on a land mind, etc. Heck, how many people take for granted the sewer will be working? Society and communities sacrificed before she was born to create these environments but she doesn’t consider that at all. All she thinks about is how hard she worked for everything she’s got and how others don’t work so hard, make stupid choices and deserve what they get. She doesn’t even begin to comprehend how lucky she was. If for no other reason than the ladder she climbed up on isn’t even there anymore at least not in the way it was for her. She doesn’t see the real ‘game’ being played at all. Heck, I’m sure a similar thing could be said about me. There is no justification for the levels of inequality and environmental destruction we are experiencing. Period. We can all consider ourselves fools, even for entertaining debating these issues much longer. We need to be discussing concrete actions, not theoretical justifications. Everyone must face the randomness of the universe every day. The only certainty know is the one WE create as human beings- one and together. Why is it do you think that the elite never break ranks. They are creating their own certainty in an uncertain world. Heads I win, tails you loose. TBTF. Race to the bottom. The new normal. Political capture using the revolving door techniques. Human evolution is racing toward a crisis point. Ending inequality and world conflict are at the focal point of this outcome. Leaders that continue to use the outdated modes of social control will either drive us over the cliff to destruction, or will loose the ability to control outcomes as their numbers dwindle. The day the revelation is made that the elite are full of crap, is the day change becomes possible. It seems large social structures will always come crashing down. The weakness in human nature and flaws in our social structures lead to eventual failure. Greed and selfish action is seldom tolerated is smaller structures. I think there will always be inequality between people on many many dimensions. I am constantly humbled by how much I don’t know that other people know, people less well educated and I suspect less intelligent — whatever that means — than I am. I celebrate this inequality and sincerely hope this larger knowledge shared with mine and the knowledge of many others will suffice to address the great challenges we face in the all too near future. HOWEVER — inequality as a matter of power relations — that is different matter. If I were my great great grandson I could never forgive what I have allowed through my cowardice and intent to have a surviving great great grandson — or granddaughter. I am not sure I really understand the intention of this paper. The example used, that 20% of $90,000 income must be paid in taxes, and then taking surveys of how that distribution should work seems to ignore whether or not the respondents actually understand basic math. The “easy” answer is that Person A pays $15,000 and person B pays $3,000 which is the equivalent of a flat tax. And yet, that’s not how most responded. Only 5% selected the easy answer. Which makes me wonder if the targets of the survey even understand basic math. So I guess I am questioning the questioning…. Actually the easiest answer is for person A to pay the whole $18,000. He’s the one who is getting more money before taxes, and if he pays the $18,000, he’s still getting $12,000 more than person B. The “flat tax” is probably the second easiest answer. However, since neither person is doing any tangible work to receive the money, the fairest result is for both to get the same after “taxes”. If person A pays $24,000, $18,000 will go to the “state”, and $6,000 will go to person B, and both A and B will each get $36,000. 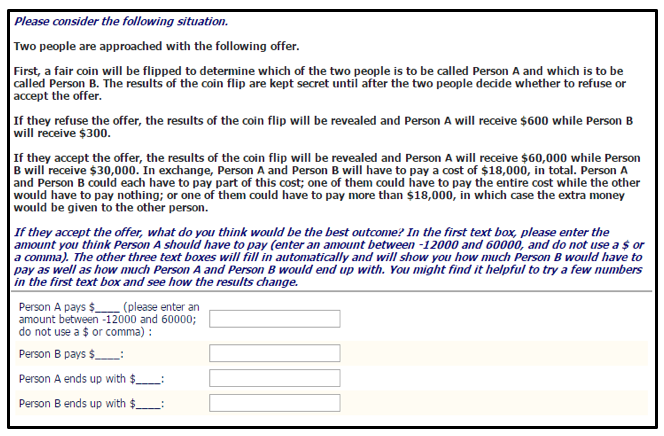 Person B can force person A to agree to this, because if they don’t agree, then person A only gets $600 and person B gets $300. If we want to get complicated, then the result should be such that the difference between person A’s portion and person B’s portion is $300, whether they agree or not. So if they agree, person A would pay $23,850 ($18,000 to the “state” and $5,850 to person B), and person A would get $36,150. In that case, person B would get $35,850. The difference between person A’s income and person B’s income is $300, just as it would have been if they had not agreed. The “easy” answer is that Person A pays $15,000 and person B pays $3,000 which is the equivalent of a flat tax. Wait a minute. 20% of $60,000 is $12,000, and 20% of $30,000 is $6,000. Not $15,000 and $3,000. Anyhow, I still like my solution where person A pays $23,850. Why not question the $90K — of income? — instead. In terms of the money and wealth of the people who run our government and economy, and control and direct our lives and the lives of millions of others — $90K barely registers. I read this post as questioning the basis for progressive taxation — a rationale for taxation we sorely lack. I have little faith in studies like these. My first question is always, “What’s a respondent?” Define Person, please. Notice how they’re treated as entirely substitutable standardized parts. That is, as if people were molecules or atoms. But try as it might, social science ain’t physics. You can’t just grab the nearest few people, sit them down at a keyboard to play your game (for credit? for fun? on assignment?) and then substitute their behavior for the behavior of all people everywhere. Which people, where, under what conditions, and how many? Was the sample representative? Did the author go to prisons, ghettos, farm fields, etc. and ask them? Or was it proximity and ease of access that defined it? It’s the old “college sophomores in the lab” problem. As an undergrad psych student, I saw time and time again how people gamed the system, yet PhD candidates and professors took the data as gospel. It’s only too often more a demonstration of ability to work the method, to play the academic game, than testing hypotheses. Or I guess as coders say, GIGO. Also you might ask what meaning to attribute to a questionable measure of human opinions about a concept like “what is fair” in an environment completely dominated by promotion of ideas of fairness which to my mind are quite unfair. So I agree with you and wonder why you don’t pres further. This post frames inequality in terms of “fairness” and luck/pluck and treats money as some form of prize in an economic “game”. I suppose this way of looking at things works up to a point as long as we look to those below us and congratulate our merit while accepting some greater luck of those above us which help rationalize our merit. But any concepts of fairness or the justice things rapidly fractures if we look past those in our own neighborhood. Riding a bubble through the slums here and elsewhere in the world it becomes very difficult to rationalize justice and merit. Looking in the other direction toward the high rises and gated estates and manifestations of wealth I can’t even imagine and the fragments of the fairness or justice of things evaporates completely. The “findings” of this post do not scale — at all. Aside from the living standard which money/wealth affords the notions of “fairness” “merit” and “luck” this post contemplates there is no discussion of other aspects of money/wealth conveniently passed over and ignored. In our society our money-culture money/wealth is equated with merit. It packages demand for automatic respect and deference. This pecuniary one-size-fits all measure for character, intellect, excellence, creativity, leadership, even physical attractiveness undermines all these values reducing them to commodities of the marketplace. But the ability of money/wealth to control and command the lives of others and the collective resources of society is far more pernicious. What concept of “fairness” or “justice” can justify this aspect of inequality? JG – Rogge covers this in his book: “World Poverty and Human Rights: Cosmopolitan Responsibilities and Reforms” ( https://en.wikipedia.org/wiki/World_Poverty_and_Human_Rights ) using the perfect example of the acquisition and management of natural resources. Your comment to mine leaves me quizzical. Though I value any comments to mine given my wondering how far I am from what is reasonable — global poverty is far beyond the complexity of anything I might address in my comments. I grant global poverty is not a problem beyond solution — but first we need to address the problems of economic philosophy used to justify and enable the gross inequalities of our world. I have not read Rogge’s book. There are far too many books I have not read and of the books i have read there are far too many I have not really understood. I am also concerned by how little this post seems to have stimulated our commentariat — an entity I have come to greatly respect. Please elaborate on what you mean. I am concerned by this post’s lack of consideration of the political power money/wealth confers — something beyond and to some degree outside considerations of poverty and the suffering inequality fosters — even celebrates. My poor non-economist head reels at this article. OK, it’s a mind exercise to determine attitudes toward taxation. But it’s completely made up – Fig. 1 Tossing a fair coin, doesn’t scan for me, it’s like a crap game. At the random flip of a coin, A gets twice as much as B, but where did the $18k penalty come from? Is it arbitrary? Why “could” one have to pay more, and who decides? And where did the $24k figure come from? Seems obvious to me A got twice as much, and so should pay 2 out of 3 parts of the penalty. So, re brute luck and tax policy, if inherited wealth or investment income (i.e. rent) vs. wage income is really what’s meant here, please say so. I view this post — at least in part — as questioning the basis for a progressive tax rate based on attitudes toward what is “fair” in turn based on a — sorry — hokey experiment to test attitudes about what is fair. To me the problem is a problem of scale. If we’re talking about my place opposed to that of the fellow in the house on the hill or the house down the street — I might — on a good day — buy-in to this post’s notions about “fairness”. Those notions do NOT scale and they don’t give any consideration to the powers of control and command which great wealth confers. What I can accept in the way of inequality between myself and the guy on the hill does NOT scale when the guy on the hill doesn’t live on the hill and only owns the house on the hill as a reminder of his lowly beginnings. He lives in a multi-million dollar 10,000 sq. ft. condominium high in New York City and a similar flat in London, and in Tai Pei and Shanghai and Paris and … and lives in none of them really. And I cannot accept the poverty and oppression found in Camden, New Jersey, Southside Chicago, … in Brazilian favelas or the slums of Seoul. Perhaps the failure to scale arises from the compounded flaws that, first, this post is all about “I” and speaks not at all to “we”; and, second, as your comments point out, uses money in typical fashion as the lowest common denominator determining utility and fairness when, ‘we’ demands a focus on the highest not lowest common denominator (and that’s not mathematically or logically convenient). Further, ‘we’ must be something more meaningful than a mere agglomeration of “I’s”. Those are at best ‘thin we’s’ easily seduced into theoretical constructs that, in fact, have nothing to do with the actual experience of ‘we’ in any meaningful way. Real, ‘thick’ we’s comprised of actual people who persistently interact and truly know they share some to a lot of their shared fates respond to questions of brute luck, fairness and inequality together (whether democratically or otherwise or blends of ways). They don’t determine their shared fates with an eye on abstract individualism grounded in lowest common denominators of ‘utility’. They actually care about ‘what makes most sense for us together’ and balk at devices, questions — indeed swindles — aimed at tearing apart the fabric of ‘we’. Milton Freidman, the man that wrecked the world with bad economics. Milton Freidman’s charm, energy and charisma seduced his students and global elites alike into believing he had come up with an economics that could transform the world. His students loved the idea of transforming the world through economics as it made them feel so important. Global elites loved his economics as it worked so well for them and gave a scientific backing for a world that was one that they had always wanted. Unfortunately, there were a lot of problems with his economics that are making themselves felt today. The Classical Economists were the first economists to look at and analyse the world around them, a world of small state, raw capitalism. They noted how the moneyed classes were always rent seeking and looking to maintain themselves in luxury and leisure, through rent and interest. This sucked money out of the productive side of the economy, reducing the purchasing power within the nation. They noted how the cost of living must be kept low, to keep the basic minimum wage low, so nations could be competitive in the international arena. This knowledge is missing today. The UK dream is to live like the idle, rich rentier, with a BTL portfolio extracting “unearned” rental income from the “earned” income of generation rent. In the US they removed all the things that kept the cost of living down, not realising these costs would have to be covered by wages. The US now has a very high minimum wage due to soaring costs of housing, healthcare and student loans and US businesses are squealing. The true nature of money and debt were understood in the 1930s when the Chicago Plan was put forward after a thorough investigation into the 1929 bust. Today’s ubiquitous housing boom is like a printing press creating more and more money as the new mortgage debt comes into existence. The money supply expands and pours into the real economy making everything look really good. The only thing that is really happening is the inflation of the price of things that exist already, houses. All the debt being created is not productive investment. The cost of living goes up and more and more money gets sucked into mortgage and rent payments sucking purchasing power out of the economy. The increasing cost of living, raises the basic minimum wage pricing labour out of international labour markets. Irving Fisher also looked into the 1929 bust and developed a theory of economic crises called debt-deflation, which attributed the crises to the bursting of a credit bubble. Irving Fisher looked into debt inflated asset bubbles and realised the huge danger they pose to the whole economy. The ubiquitous housing boom is a debt inflated asset bubble, with huge amounts of debt spread through the whole economy, when it bursts there is hell to pay. This was first seen in Japan in 1989, its economy has never recovered. It was repeated in the US and leveraged up with derivatives leading to 2008. Ireland and Spain have also wrecked their economies with housing bubbles. There are housing bubbles around the world, ready to burst and pull that nation into debt deflation. Milton Freidman worked at the Chicago School of Economics and was the global ambassador for his dire economics. This dire economics and the University of Chicago were also behind the design of the Euro, no wonder it doesn’t work. Their dire economics predicts the Euro-zone economies will converge into a stable equilibrium. The reality – the economies are diverging and the poorer nations are going under. 2008 – How did that happen? The neoclassical economists didn’t have a clue as the Minsky Moment was approaching. Two people who did see 2008 coming (there aren’t many). Steve Keen – A whole book “Debunking Economics” on this dire neoclassical economics and the problems of not using realistic assumptions on money and debt. Michael Hudson – Calls it “junk” economics and has written a whole book on the problems of forgetting the world of Classical Economics – Killing the Host. Naomi Klein “Shock Doctrine” goes into the brutality of the Chicago Boys and Berkeley Mafia in implementing their economic vision. A right wing “Khmer Rouge” that descended on developing nations to wipe away left wing thinking. It’s bad and Milton Freidman was behind it. Marginalist economics tends to be characterised primarily by a couple of distinct axioms that operate ‘under the surface’ to produce its key results. these are simplistically characterise as: the axiom of methodological individualism; the axiom of methodological instrumentalism; and the axiom of methodological equilibration, where models derived from them have ex-ante predictive power. Which in turn is just Epicurean ontology where everything becomes objects and not subjects where Epicurean ethics involves individuals maximising pleasure and minimising pain — or, as the marginalists would put it, maximising utility and minimising disutility — it simply follows from the basic ontological position that is put forward. Just to put a more modern perspective on it – see: Note that the patient suffering from schizophrenia tends not to answer the questions directed at him but rather responds with complete non-sequiturs. You might also like – Le Bon, Gustave. The Crowd: A Study of the Popular Mind, you can get it free online. Chronicling the rise and fall of the efficient market theory and the century-long making of the modern financial industry, Justin Fox’s “The Myth of the Rational Market” is as much an intellectual whodunit as a cultural history of the perils and possibilities of risk. The book brings to life the people and ideas that forged modern finance and investing, from the formative days of Wall Street through the Great Depression and into the financial calamity of today. It’s a tale that features professors who made and lost fortunes, battled fiercely over ideas, beat the house in blackjack, wrote bestselling books, and played major roles on the world stage. It’s also a tale of Wall Street’s evolution, the power of the market to generate wealth and wreak havoc, and free market capitalism’s war with itself. The efficient market hypothesis–long part of academic folklore but codified in the 1960s at the University of Chicago–has evolved into a powerful myth. It has been the maker and loser of fortunes, the driver of trillions of dollars, the inspiration for index funds and vast new derivatives markets, and the guidepost for thousands of careers. The theory holds that the market is always right, and that the decisions of millions of rational investors, all acting on information to outsmart one another, always provide the best judge of a stock’s value. That myth is crumbling. Disheveled Marsupial…. Main stream econnomics is an extenuation of much deeper metaphysical and resultant ideological beliefs…. Does anyone have the link with the charts about what people believe is fair taxation vs. what reality is in the US? If I remember correctly, I believe that it directly and quickly refutes the “brute luck” piece. It was a bar chart showing the whole broken down into percentages belief of what was fair in one chart, belief of what the US was like in another, and the actual breakdown in the final one. What I always find interesting about the tax discussion is how ‘taxes’ means different things to different people. Look at what’s included by the article writer and what’s not. We’re looking at federal income taxes. Where’s the state income taxes? state and local sales taxes? where are the hidden costs like oh, parking meters / permits, 911 calls/monthly fees, assistance from the coast guard, the doubling / tripling of water costs in place like Flint even when residents can’t use the water, the budget swaps that pull millions from a university system budget to pay for a professional sports team stadium, the fees paid to private enterprises for paroles and probations, the municipality tickets which fill the gaps in a community’s budget, the money required to get access to a public defender, the co-pays for doctors visits, the cost of playing sports / band / art in some public school systems, how much money is filtered from the public school system to private schools and charters, city / state franchise & special taxes on gas / electric / cable, special parking permits for state parks, bicycle permits for trail access, etc., etc., etc. And let’s not forget the time and energy it takes to deal with some of these expenses. Many of these used to be paid for the entire community / society. Now the individuals gets nickeled and dimed for these costs. And let’s face it some people can’t come up with the money for the little things which many us take for granted and we don’t even see them or the tax? Heck, the way we model the tax discussions these fees for access aren’t even ‘real’ taxes. Nice to see someone questioning the system. Luck plays a bigger role in life than most people realize and their is a very good book out on this issue: Success and Luck by Robert Frank. That being said the U.S. has developed a predatory economic system that shows little or no concern for the welfare of its own citizens who are ruthlessly exploited as expendable and unwanted costs. The private equity industry has mercilessly put downward pressure on workers for nearly three decades so as to enrich the deal’s sponsors. The same can be said for nearly all corporations who ruthlessly take advantage of global labor arbitrage opportunities and routinely give American jobs to foreign peasants in effort to boost the bottom line thus enhancing CEO pay. It’s a rigged and predatory system. I know that I’m late to the party, but. . . . I think that Weinzierl mischaracterizes his results. He states: “The standard model of optimal tax policy gives a clear recommendation in this hypothetical situation of full equalisation of outcomes. Person A should pay $24,000 because the brute luck of the coin flip provides no reason to allow the lucky person to keep the larger sum. It seems to me that his respondents were somewhat less egalitarian. 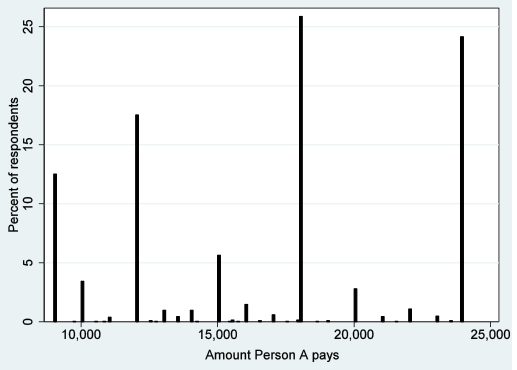 The most frequent response (more than 25%) was that Person A should pay 18,000; i. e., all the “tax”. The second most frequent response (almost 25%) was that Person A should pay 24,000; i. e., egalitarian redistribution. The third most frequent response (between 15 and 20%) was that Person A should pay 12,000; i. e. a “flat tax”. The fourth most frequent response (between 10 and 15%) was that Person A should pay 9,000; i. e., a “poll tax”. A better characterization of the results might be this. The egalitarian result was not the most frequent choice, garnering a bit less than 25% of the responses. But it was a close second to the most frequent choice, in which Player A paid all the “tax”. More than 1/2 of the respondents thought that Player A should pay at least the full 18,000. They think that in this game of luck the less fortunate player should pay nothing. Around 1/3 think that Player B should pay at least 6,000.